P&G shareholders just received the tiniest of dividend raises. Here's why that's not such a big deal. Procter & Gamble's (NYSE:PG) dividend just reached an awesome milestone. The consumer goods giant hiked its payout for the 60th consecutive year. The fact that this dividend has marched higher through dozens of booms and busts is a testament to the power of a business that's anchored by a deep portfolio of consumer staple brands like Pampers diapers and Tide detergent. Fiscal 2016's rise moved the quarterly dividend higher by less than $0.01 to $0.6695 per share. That equates to just a 1% payout raise (compared to the previous year's 3%, and the double-digit hikes that shareholders saw through most of the early 2000s). A big clue as to why P&G was so stingy this year can be found in its dividend announcement, where management warned that it expects the payout to soak up 70% of earnings this year. That's good news, but only because it would mark a sharp improvement over 2015 when the $7.4 billion of dividends accounted for more than 100% of P&G's $7 billion net profit. CEO David Taylor and his executive team forecast only minor sales growth this year as P&G continues to struggle with a challenging global selling environment. Yes, earnings should start spiking higher as cost cuts mount up, underperforming brands leave the picture, and foreign currency issues settle down. But it may take a few fiscal years to get the company's dividend back down to a healthier portion of profits. 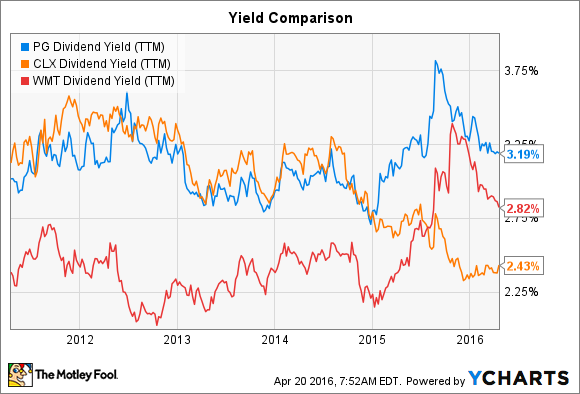 Another key driver behind the tiny dividend raise is yield. 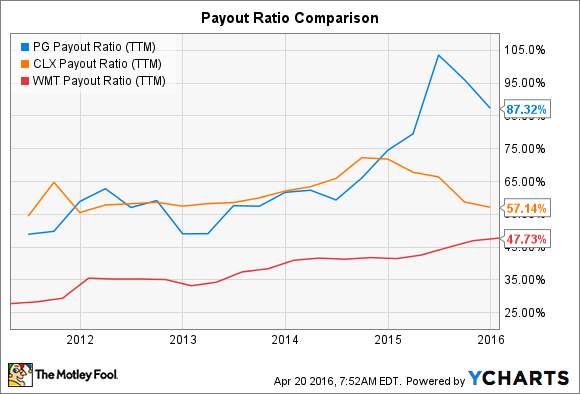 Specifically, P&G's payout is unusually high both in a historical sense and when compared to other dividend giants. At 3.2%, the dividend trounces Wal-Mart's 2.8% and Clorox's 2.4%. It's also far ahead of rival Unilever (NYSE:UL). With help from a faster organic sales growth rate than P&G's, Unilever boosted its dividend by a solid 6% this year. However, investors can still achieve a bigger dividend by purchasing P&G shares right now. Ideally, income investors would like to see both a strong yield and above-average growth, but it's hard to complain about a dividend that pays over 3% per year. In any case, P&G has other plans to deliver more cash to shareholders, and they don't involve aggressive payout hikes that might put its six-decade dividend-raising streak at risk. Instead, management targets boosting its cash returns to an $18 billion annual pace from the $12 billion it has averaged over the last few years through much higher stock repurchase spending. The mountain of cash will be funded by cost cuts and brand divestments that -- after raising billions of dollars upfront -- should produce a faster-growing, more profitable company over the long term. That's why shareholders can be confident that their company still prioritizes returning excess cash to them, even if P&G's power to do that through dividend hikes is limited right now.